(LOCATION: Cape Coral FL) The Morgan 33 Out Island has the classic style and comfortable accommodations that Charles Morgan designs guarantee. Whether you are planning a weekend getaway, or a vacation cruise this Morgan is ready to accommodate. On deck we have a roomy cockpit with ample seating and bimini top. The cockpit has a steering pedestal with stainless steel wheel and compass. Bulkhead mounted electronics provide necessary information. Equipped bow to stern with anchor and rode, Endurance windlass, stainless steel bow rail, side stanchions, stern rail, and swim latter. Sails and rigging are in good shape with Pro-Furl roller furling, a Lewmar #8 winch, and two Lewmar #40 2-speed winches. The interior roomy with forward stateroom, enclosed head, open salon, full galley, and quarterberh. The salon features a large wraparound dinette to starboard with a long settee to port. The galley is aft to port with white cabinets with teak trim, stainless steel sink, two-burner alcohol range with oven, and a top-loading ice box. Across from the galley is a nav station with fold-away chart table. There's ample galley storage as well as storage in general. The forward stateroom has a large v-berth forward with under-berth storage and hanging locker. The enclosed head compartment has head, vanity with stainless steel sink and shower. The dinette coverts to a double berth, the settee a single berth and there is a quarterberth aft. Auxiliary power is provided by a 25-hp Volvo FWC diesel engine with 380 hours. LEVIATHAN wears her years well, needs a bit of TLC, and is priced accordingly. 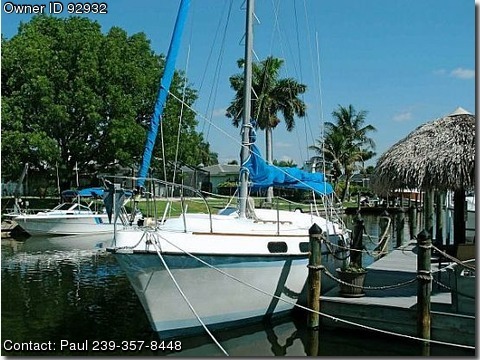 Call now for more information and to schedule a showing of this Morgan 33 Out Island.